Our mission is to inspire adults through the active study of scripture and to create an atmosphere of community, with Christ at the center of all we do. Adult baptized Catholics with a desire for reception of the Sacrament of Confirmation on Pentecost Sunday…this is for you! Holy Trinity offers Confirmation preparation classes once a year for Catholic adults. The journey consists of four must attend classes – Tuesday, May 7, Tuesday May 14, Tuesday, May 21 & Tuesday, May 28, 2019. Classes are from 7:00-8:30pm. Registration forms are available in the office or by clicking here. We are unable to accept electronic or mailed completed registration forms. Please bring during office hours or before/after any Mass time on the weekends. If you need to register as a parish member, please visit our reception during office hours. 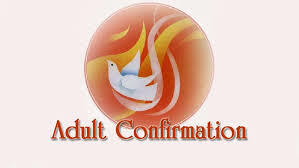 The Sacrament of Confirmation will be celebrated on Pentecost Sunday weekend, June 8 & 9, 2019!